Our Training Management Centre App makes it simple, fast and flexible. At PD Training we believe measuring the success of what we deliver for you is important. we also recognise that people don't want to take the time to do a whole lot of extra work ticking boxes for what some people perceive as 'un-measurable'. So we took an approach that reflects the best academic theory, and made it all amazingly fast and easy using our Training Management Centre. and authored books from 1954 through to the 2000’s with some of his most famous work in the 1990’s. Learning - the resulting increase in knowledge and/or skills, and change in attitudes. This evaluation occurs during the training in the form of either a knowledge demonstration or test. Behavior - transfer of knowledge, skills, and/or attitudes from classroom to the job (change in job behavior due to training program). This evaluation occurs 3–6 months post training while the trainee is performing the job. 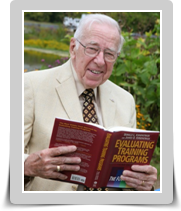 Evaluation usually occurs through observation. The PD Training Training Management Centre supports the Kirkpatrick ‘4 Levels of ROI Reporting’. Our trainers confirm learning, and check for application and the need for clarification during the day. 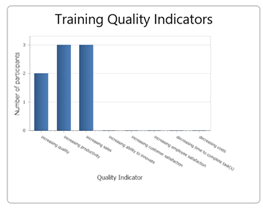 Information to review this is collected in our ROI version of Post Course evaluation and reported in the Training Quality Indicators Table where it shows the differences the participants feel empowered to make once they return back to work. 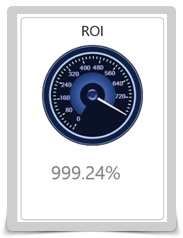 This is forecasted by our ROI feature, using the ROI version of our Post-Course evaluation. 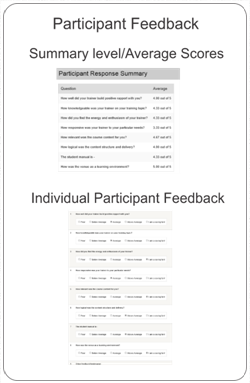 The ROI version of our Post Course evaluation asks participants to quantify how much more effective they will be (how differently they will behave/perform) as a consequence of applying what they learned in class. value, we keep the default process as flexible as possible.